SHANTAR OF SATURN: [Intoned:] Shantar of Tristar Command does greet you on Earth. [Spoken:] Light workers of the 144,000 elect on planet Earth, I am Shantar of Tristar Command, aboard Dr. Hannibal’s mother ship #1235 at this hour, in hierarchal coordination with Master St. Germain/Dr. Hannibal for the triple amplification of your light during this Easter season, leading now into spring in this hemisphere of the planet Earth. What we are able to stabilize and to balance through one and two and three, we are able to effect through each of the 144,000 symbolic light workers on planet Earth through the I Am Self. For the electromagnetic essence that is expressed within one encompasses the all. Therefore, think not that these grounding procedures are put into motion for a small unit of Earth-based spiritual, enlightened beings; for we do reach all ranks through all planes in these endeavors to ground on Earth the select transmutation frequencies to translate you quickly into your I Am demonstrations, further enhanced in these days. 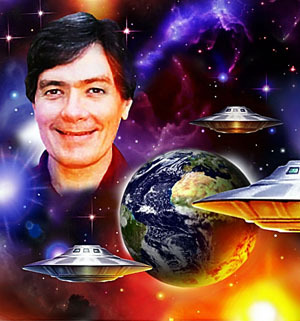 Each time I have been able to connect in this outward way through these vocalizations in these communiqués, I have been able to embed within your third dimensional frequency these higher elements of extraterrestrial bombardments, to bring you further into the heightened force field of Christ action that we are endeavoring to propagate amongst all on Earth. Look upon these translations with joy and thanksgiving, for we give them to you for your benefit in the demonstrations that you are now growing into for Sananda’s Second Coming plan. Hold steady in this light, for the mass thought forms of mankind around planet Earth are in a quickened state of shift. You might say, from your biblical traditions, that you have sown the wind and now shall reap the whirlwind. * Be that as it may, your job — and I speak to those of the 144,000 elect — is to pierce through the confusions represented by these shifting mass thought forms, and to perceive the light of the I Am and anchor it through your mind, body and soul to a higher degree than you have done during your incarnations in this Latter-Day time period. Dr. Hannibal has allowed me the use of his disciple — who also is my comrade from past experience on the planet Saturn in purification rites of passage — because he seeks to bring in these specialized elements at this time to jump-start the 144,000 into these new I Am demonstrations that are now being set before you immediately in this spring cycle of Easter resurrection. As we have stated on previous occasions, we effect these measures in full coordination with Sananda aboard his master ship #10, where he is guiding the entire procedure for this Second Coming upliftment. So, be assured that my team and I of Tristar mechanisms are not acting on our own accord, but are in full accord with the Hierarchal Board and with the ascended masters of this solar system who are effectuating these new standards of Christ action on planet Earth as it is being prepared for its reunification within the Federation of Planets. That will come in God’s good time as Sananda is able to materialize himself on this planet through his Second Coming actions. But know that that is the goal, for it so has been decreed from co-titular heads Michael and Maitreya. And we who are aligned with the will of God and with the love of God do obey; and so must you if you heed these hierarchal calls to action. Allow yourselves to be raised into this higher light, and your third dimensional frequencies will automatically be translated by the suffusion of light-body anchoring. Of yourself, you can do nothing; but God does all things through you if you allow the Father-Mother Creator to fulfill Himself and Herself within your form. We are in simultaneous relay through many hieronic units stationed in etheria around this planet Earth, who also are embedding these hierarchal instructions into those light workers who are receptive to this accelerated planetary reawakening. Again, we perform our actions not through one sole unit but through all units thus aligned with Sananda, master teacher of this planetary sphere. Thus, we shall be about our work over the next weeks and months to insure that these processes have been fully integrated by the time we complete our commission as formulated through specific guidance of St. Germain/Dr. Hannibal, Chohan of the Sixth Ray of Transmutation in this solar system and also guiding etheric influence for all spacecraft activities in this Western Hemisphere. All is in readiness. 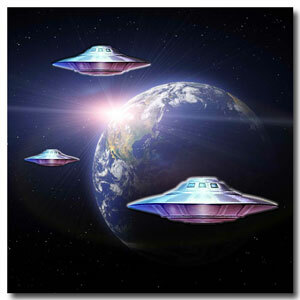 As you might say, we have pulled the switch to release these frequencies now throughout planet Earth. Hail to the Christ in thee, for in the Christ you operate for the highest good of all on Earth and within this solar system. So be it in truth. Shantar, commander commissioned for Tristar. Over and out. REBEKAH OF VENUS: Beloved coworkers of Earth, I am Rebekah. June of Venus is with me. For in this hieronic download of light, we bring a necessary feminine balance to these proceedings; and are especially effective in grounding this focus through this particular Motah outpost [Phillel], who has been a student of ours on our planet in times past, now reawakened in these Latter Days for his Second Coming demonstrations. 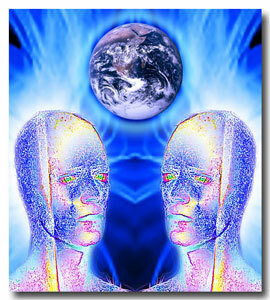 But we speak not to this channel alone, for we address our polarity balance to all light workers on Earth. If you are centered within the male-female polarity balance of your own Christ Self, you are thus aligned supremely with Father-Mother God and are in the best position thereby to accept these higher transmutation frequencies which are leading you into a new grounding of your fourth dimensional, immortal, resurrected, light-body forms. We have achieved this balance, and do demonstrate this balance for you as an example that you may follow through the crucible of your own translations of light through your incarnational grounding foci on planet Earth. Therefore, you will note that we operate in sync with what Commander Shantar has brought through for your accelerated upliftment. We enfold you in our love vibration specifically, so that you may welcome these changes now afoot. For as you pass through these individual and collective purifications, you will center yourselves upon the purity of your I Am focus and thus will instill on planet Earth the Christ embodiment that we hold forth for you to demonstrate. Be healed. Be balanced. Be translated into this light, and rejoice that your resurrection is nigh. So be it, and you shall be the Christ in action on Earth now and forevermore. Rebekah, with June, of Venusian ethereal realms, bringing this polarity balance into your awareness at this moment in time. Amen. Note: Immediately after saying the Lord’s Prayer to enter our weekly Hierarchal Board meditation, I became aware of a space beam clamped onto my crown chakra. For about a half hour I projected spiritual energies to heal and to transmute various individuals and planetary situations. Eventually my focus shifted, and I became aware of an unfamiliar extraterrestrial energy imbuing my auric field. But it only lasted about a minute. Before I could get a lock on it, the sensation was gone. Then Shantar of Saturn contacted me, projecting clairvoyantly his signal of the four-pointed star, symbol of Tristar Command. He was at the hieronic controls aboard Dr. Hannibal’s mother ship. As he began to manipulate the hieronic beam to interweave his electromagnetic force field with mine, I became aware also of the presence of Rebekah of Venus. She stood directly behind me, resting her hands on my shoulders. 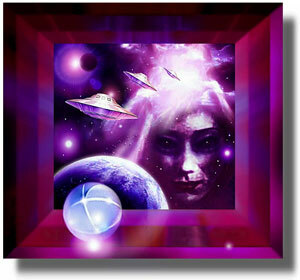 With her counterbalancing feminine polarity, she steadied my vibration for Shantar’s high-frequency hieronic contact. Suddenly another female extraterrestrial joined her. She also stood behind me, to the right of Rebekah, resting her hands on my shoulders, thereby doubling the feminine polarity field. She did not identify herself, but she and Rebekah appeared to be twins. They both were Venusian. They were of the same average height and slim build. They both had dark eyes, and their dark shoulder-length hair was coiffed with bangs in sort of a Prince Valiant style. Neither wore any jewelry. Both females were dressed in a long white robe, as would be worn in Venusian temple practices. Incrementally, Shantar’s overshadowing became predominant and required my full attention. My chakras revved up, and the rhythm of my respiration changed. The Saturnian slowly levitated my hands and positioned them strategically in front of my throat chakra in order to prepare my vibration magnetically for his vocal communication. He also performed universal sign language, once again utilizing Saturnian mystery symbols to implant the Tristar vibrational frequency on Earth. At length, he signaled that he was ready to channel. Uncharacteristically, Shantar began his communication by intoning (singing) the first sentence. My impression was that he used the vibration of the musical tones to finalize his hieronic grounding through my chakra system. For subsequently his delivery was unusually quick and forceful, strongly expressive of the male-positive polarity. When Shantar finished his message and withdrew, Rebekah stepped forward. With her was the second Venusian female, whom she identified as June of Venus. Their twin vibration of feminine polarity, a counterpoint to Shantar’s male force, instantly balanced my force field. On the voice recording, one can clearly hear the strikingly different vibration, inflection and pace of Rebekah’s delivery. After the communications session, my vibrational frequency was so altered that for the next half hour I was slightly dizzy and my legs were weak. Photos: (1) Tristar Jump-starts Elect, collage by author with background image © by Igor Chaikoskiy, courtesy of Fotolia.com, and spaceships © by Hartmut Jager. (2) Elsewhere Reflection, collage by author with NASA photo of Earth and light-body images from Elsewhere © by Hartmut Jager. (3) Glacial Haven Amped © by Hartmut Jager (author of original background unknown). (4) The Observer © by Hartmut Jager. LISTEN TO PODCAST: Click on the “Play” button below to listen to the above communication, as recorded live on 3/20/13. This recording was released on I Am Network of Light tape #1067B, for the week of 4/14/13. How wondrous and appropriate to receive this as we come to this Easter period. These times are turbulent and difficult, and we need all the help and ease to see us through. The example and the work of our beloved brothers and sisters, and their inexhaustible assistance and caring, give us the strength to never cease, and to go forth into the light, love in action — in peace, love, cooperation and coordination, now and forevermore. Hooray for being ready and then open to “turn on a dime” for the plan to now stay on Olkhon Island! That pattern teaches us all as we do the same in our own golden domes of life, love and peace. By our quiet examples others with us “get it” on their levels of understanding. Then they are ready to cooperate and coordinate with the transmutation powers of God now and during the East Asia Mission. I am so happy to be with you in the blogs and work we do, inner and outer planes. The Easter post of March 31 promises an astounding E.A. Mission for planet Earth and all life on it transmuting these past millions of years. Halleluja!